Exposure to ultraviolet rays and sunburn: People who have experienced prolonged exposure to sunlight and tanning booths are at an increased risk to develop skin cancer. The amount of exposure depends on the intensity of the light, length of time the skin was exposed, and whether the skin was protected with either clothing or sunscreen. In addition, severe sunburn in childhood or teenage years can increase the risk of skin cancer. Skin coloring/pigmentation: People with fair skin are 20 times more likely to develop skin cancer than people with darker skin. Caucasian people with red or blonde hair and fair skin that freckles or burns easily are at the highest risk. People with darker pigmentation can also develop skin cancer, more likely on the palms of the hands, soles of the feet, under the nails or inside the mouth. Moles: Individuals with moles may be at increased risk of developing melanoma, especially if the moles are unusual, large or multiple. Family history: Risk of developing melanoma is higher if one or more members of a person's immediate family have been diagnosed. Immune suppression: People who have illnesses affecting their immune system (such as HIV) or who are taking medicines to suppress their immune system (such as after an organ transplant) are at an increased risk of skin cancer. Occupational exposure: Individuals exposed to coal tar, pitch, creosote, arsenic compounds or radium are at increased risk to develop skin cancer. Skin cancer can be detected early and it is important to check your own skin on a monthly basis. You should take note of new marks or moles on your skin and whether or not they have changed in size or appearance. Asymmetry: The two halves of a mole do not match. Border irregularity: The edges of the mole are ragged and uneven. Color: Differing shades of tan, brown or black and sometimes patches of red, blue or white. Diameter: The mole is wider than a quarter inch in size. The American Cancer Society recommends a skin examination by a doctor every three years for people between 20 and 40 years of age and every year for anyone over the age of 40. If initial test results show abnormal skin cells, your doctor may refer you to a skin specialist called a dermatologist. If the dermatologist thinks that skin cancer may be present, a biopsy, or sample of skin from the suspicious area, will be checked for cancer. There are three types of biopsies to test for skin cancer. Shave biopsy: The doctor "shaves" or scrapes off the top layers of the skin with a surgical blade. Punch biopsy: This type removes a deeper skin sample with a tool that resembles a tiny cookie cutter. Incisional and excisional biopsies: For an incisional biopsy, a surgeon cuts through the full thickness of skin and removes a wedge for further examination. An excisional biopsy is when the entire tumor is removed. Other tests such as a chest X-ray, CT scan or MRI may be used to see if the cancer has spread to other parts of the body. Radiation therapy where the cancer cells are killed by X-rays. Surgery where the cancer cells are cut out and removed. Electrodessication where the cancer is dried with an electric current and removed. Healthy cells that grow and divide quickly are also harmed by radiation, but they are able to repair themselves in a way cancer cells cannot. External beam radiation therapy may be used to treat skin cancer and to relieve pain from cancer that has spread to the brain or bone. 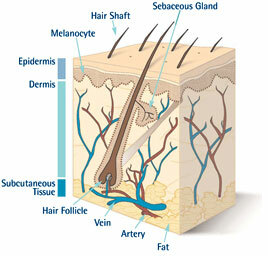 Skin cancer is often treated with superficial forms of radiation that penetrate only a short distance below the surface. Doctors will target the radiation beams at your tumor to give more radiation to the skin cancer while keeping it away from underlying organs. You may have little or no side effects from radiation therapy and be able to keep up your normal activities. Side effects are usually limited to the part of your body that receives radiation. Skin changes such as redness, dryness or itching are common side effects. You will also likely lose your hair in the area treated. Side effects should go away when the treatment ends.